Angelica Mesiti, Relay League (video still), 2017, commissioned by Artspace. Courtesy the artist, Anna Schwartz Gallery, Melbourne and Galerie Allen, Paris. Appel a tous. Ceci est notre dernier cri avant notre silence éternel. Calling all, this is our final cry before our eternal silence. Relay League, a term for a telegraphic transmission from one receiver to the next, takes as its departure point a Morse code message transmitted by the French Navy on 31 January 1997 to signal the imminent demise of this communication method. Morse code, a system of dot and dash radio signals often utilised as a language of distress at sea, was phased out after 130 years in favour of new digital communications. Inspired by this final poetic phrase, Mesiti interprets its original dots and dashes through music, choreography, and non-verbal communication. The first of the three-channel works features the musician-composer Uriel Barthélémi translating the Morse code message into a percussive score that permeates throughout the gallery. The second shows a unique form of dialogue and exchange between two dancers, Emilia Wibron Vesterlund and vision impaired Sindri Runudde. Together the pair has developed an intimate and corporeal language that communicates movement and gesture; Emilia guides Sindri’s understanding of choreography through the touch and feel of her body against his. 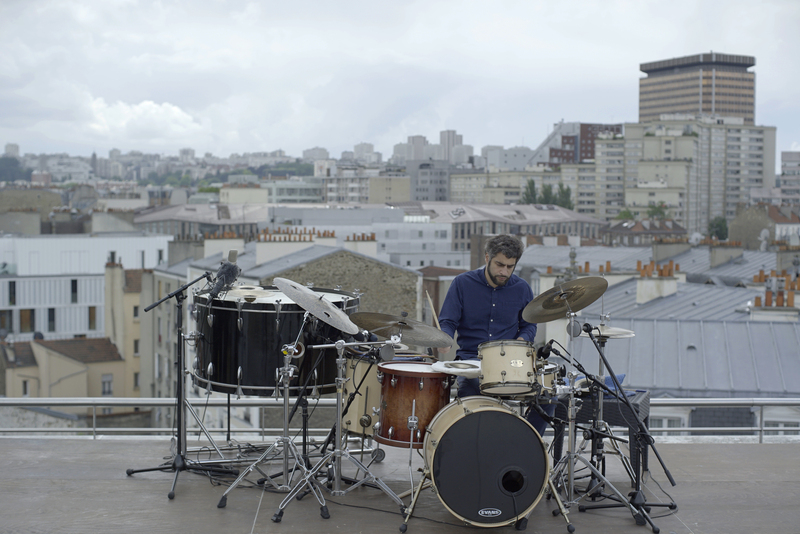 The third depicts the dancer Filipe Lourenço interpreting Uriel’s percussive sounds in a new choreography that directly references silence and vision through gestures loosely drawn from the vernacular of folk dance. This final work reveals a dialogue playing out between each of the performers, and the dots and dashes transmitted throughout the gallery produce a subtle dissonance so that the work continually slips back and forth between cohesion and dissolution. Relay League leaves a sensory impression of a language that has been transformed into a code, which in turn iterates as a score, a performance and a haptic exchange, enabling multiple acts of translation across time and space. Mesiti’s practice chronicles our present condition. She continues to grapple with experiences such as crisis and displacement – whether economic, political, social, cultural or otherwise – and confront the emotional states of distress, vulnerability and uncertainty. Relay League invokes a fundamental humility, bringing to the surface aspects of human subjectivity that are often obscured from view. To this end, the work offers a counterpoint: more than simply making visible the forms through which language and expression are silenced, she allows these complex and vital tools of human relations to materialise in ways that emphasise our need for empathy, compassion and connection. Angelica Mesiti was born in Sydney in 1976 and is currently based in Paris. She holds a Master of Fine Arts from the College of Fine Arts (now UNSW Art + Design) at the University of New South Wales. Mesiti works primarily with video and installation, incorporating performance, dance and musicality to explore ideas of community, cultural tradition and spirituality. She is interested in performed cultural traditions in a state of transformation, or at risk of extinction due to complex social, economic or cultural shifts. Relay League was curated and developed by Artspace and is touring nationally with Museums & Galleries of NSW. This project has been assisted by the Australian Government through the Australia Council, its arts funding and advisory body. The development and presentation of Relay League is supported by Commissioning Partner the Keir Foundation. Relay League was produced with the support of C ND National de la Danse, Paris and University of New South Wales Art & Design. Relay League will be accompanied by a book published by Schwartz City and designed by Formist.